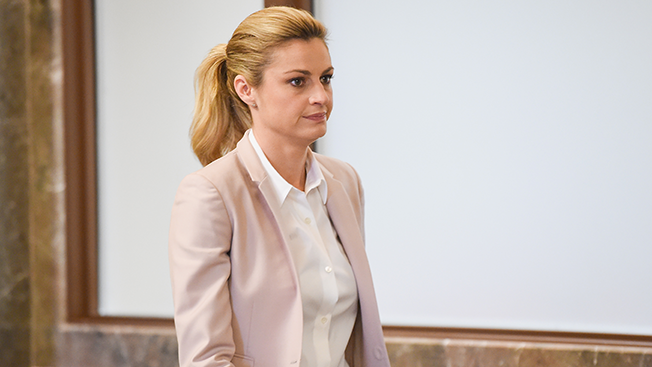 Fox Sports reporter and Dancing With the Stars host Erin Andrews was back on the stand Tuesday in her civil lawsuit against the owners of the Nashville Marriott hotel. On Monday, Andrews broke down on the stand, describing the devastation she felt after being secretly videotaped while she was naked during a stay at the hotel in 2008. She also dropped a media bombshell when she accused ESPN, her employer at the time, of forcing her to go on TV and be interviewed about it. "Because there wasn't an arrest, because we didn't know where this happened, my bosses at ESPN told me, 'Before you go back on-air for college football, we need you to give us a sit-down interview,'" she said. "That was the only way I was going to be allowed back." Andrews said ESPN was "highly recommending" the interview be on ABC's Good Morning America "because ESPN and ABC are the same." "Developments in the case have been interpreted by some to mean that ESPN was unsupportive of Erin in the aftermath of her ordeal," an ESPN spokesperson said Tuesday afternoon. "Nothing could be further from the truth. We have been and continue to be supportive of Erin." A source with knowledge of the situation said that while Andrews was encouraged to do an interview, there was no ultimatum that she do one before she could return. The network's management did provide guidance for Andrews, including suggesting she go on Good Morning America. Ultimately, she gave an interview to Oprah Winfrey. Andrews left ESPN for Fox Sports in 2012. Andrews is suing West End Hotel Partners, the owner of the Nashville Marriott at Vanderbilt University, and her stalker, Michael David Barrett, in a $75 million civil suit. In 2010, Barrett was sentenced to 30 months in prison for taking video of Andrews and sharing it online. Jurors will have to determine whether West End Hotel Partners was negligent with regard to keeping Andrews reasonably safe. One of the key accusations is that a member of the hotel staff told Barrett which room Andrews was staying in.